Wicked becomes the West End’s 10th Longest Running Show! 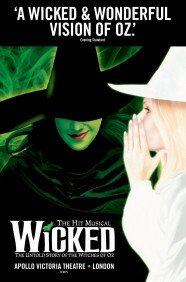 Wicked has now become the West End’s 10th longest running show. Currently in its 8th spellbinding year at London’s Apollo Victoria Theatre, this Broadway export new musical has now been seen by over 5.5 million people since its London premiere in September 2006. Having played over 3000 performances, Wicked comes in as the 10th longest running show, just below The 39 Steps at the Criterion Theatre. The number one position on the list is firmly held by The Mousetrap at St. Martin’s Theatre, having just celebrated its 60th year! Les Misérables and The Phantom of the Opera take 2nd and 3rd place, followed by The Woman in Black, Mamma Mia!, The Lion King, Stomp and Billy Elliot The Musical. Wicked has been seen by over 40 million people around the world and currently has 9 productions running in cities across the globe, including the original Broadway production that continues to play at the Gershwin Theatre after a decade of calling the theatre home. Adapted from the Gregory Maguire’s award-winning novel, Wicked re-imagines the characters from L. Frank Baum’s beloved children’s classic ‘The Wonderful Wizard of Oz’ and takes the audience on an action-packed musical theatre adventure through the Land of Oz. Extraordinary news, Hollywood megastar John Travolta, whose hit films include Grease, Saturday Night Fever and Pulp Fiction, is following in the footsteps of Sylvester Stallone, Al Pacino and er... Joan Collins by appearing in a one night only West End event; in this case he’s being interviewed on the stage of The Theatre Royal, Drury Lane by Jonathan Ross on Sunday February 16th at 6pm.